Architectural practice Michaelis Boyd has just completed the design of Casa Pastor and Plaza Pastor – two interconnected restaurants in King’s Cross, London, by acclaimed restaurateurs, Sam and James Hart and Crispin Somerville, the people behind Barrafina, Quo Vadis and the now iconic El Pastor. 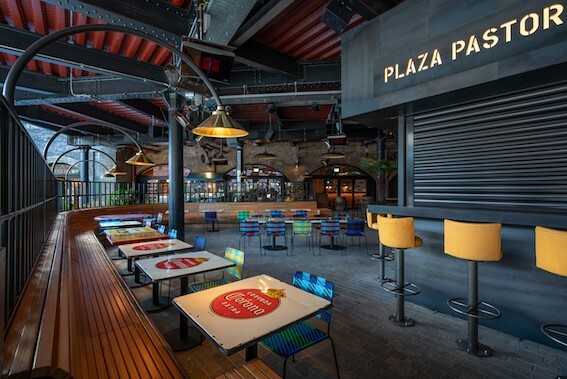 Casa Pastor and Plaza Pastor are situated in Coal Drops Yard, a former Victorian coal store that lies within the historic railway arches of King’s Cross, that is one of the largest and most exciting redevelopments currently underway in London. 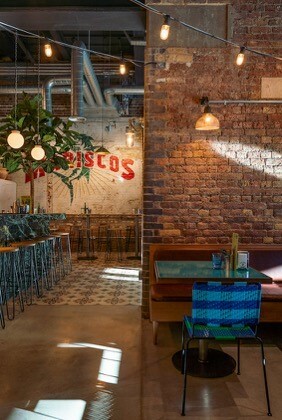 This is the second time Michaelis Boyd has worked with Harts Group; their first restaurant project together, El Pastor in London’s Borough Market opened in 2016 and was designed after an inspirational trip to Mexico to allow the design team to fully appreciate Mexican food, culture and architecture. Michaelis Boyd’s design concept for Casa Pastor and Plaza Pastor pays homage to the vibrancy of Mexico, incorporating powerful architectural and design elements to create truly authentic dining experiences. Casa Pastor forms the internal restaurant, while Plaza Pastor occupies an external heated dining terrace that is operated all year round. 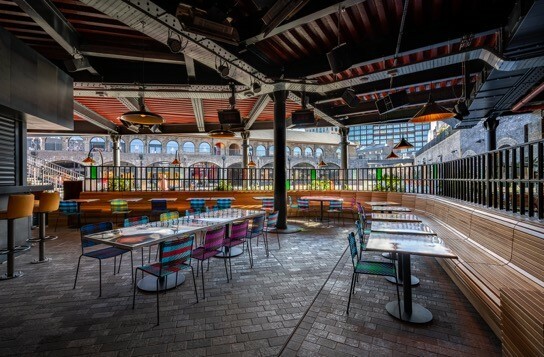 Casa Pastor, the new big sister restaurant to the original El Pastor in Borough market, is a vibrant 80-cover restaurant that takes advantage of the original features of the space, with exposed industrial brick walls and vast arched glazed windows. 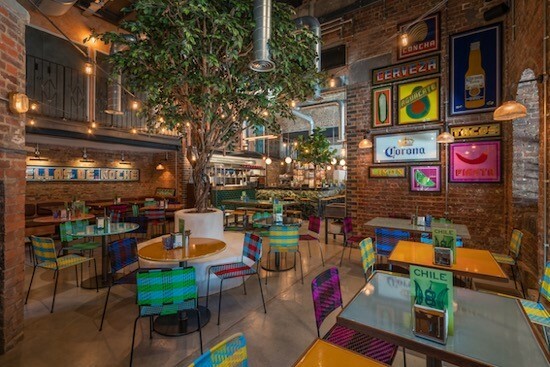 The restaurant features five-metre high ceilings, eye-catching antique patterned cement tiles, Mexican murals and motifs and custom-designed hanging basket lighting, a nod to Mexican woven basket lights. 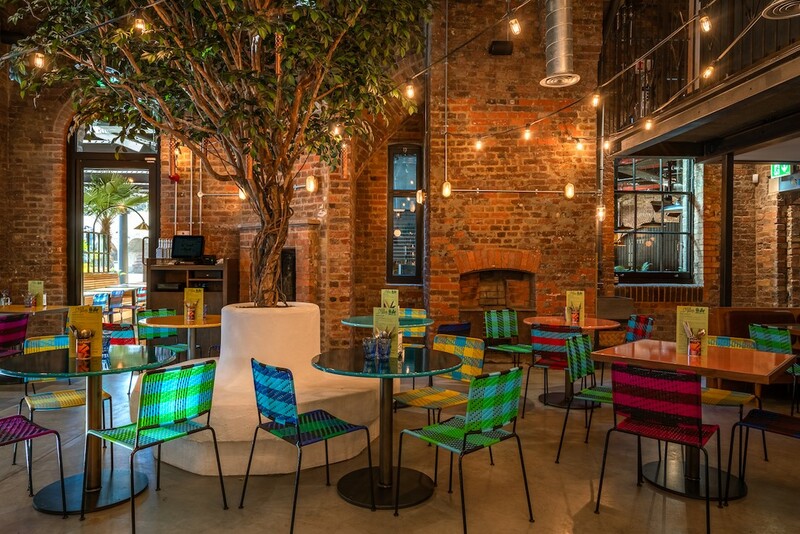 Bar-style counter tables feature brightly glazed Pyrolave table tops reflecting the spirit, energy and colour of Mexico. 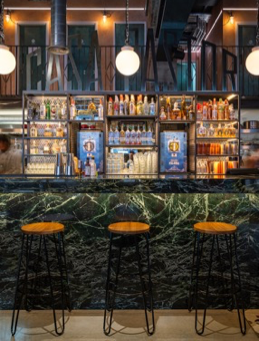 Bespoke encaustic tile perches from Mosaic del Sur are positioned along the entrance perimeter and have been designed to encourage diners to enjoy cocktails in a lively and authentically Mexican environment. In the centre of the restaurant, the ‘mezcaleria’ bar is clad in dazzling emerald marble with four-metre tall tropical trees positioned either side, while an open kitchen provides a theatrical focal point for the restaurant. Casa Pastor’s central dining area echoes Borough’s El Pastor, with fixed banquette seating featuring black leather cushions hung individually with leather straps and a colourful array of India Mahdavi chairs. Tinted festoon lighting and antique glass wall lights create a relaxed ambience. Casa Pastor’s mezzanine level leads to a copper and zinc clad balcony with pink plaster walls and neon lighting that evokes the vibrancy of Mexican street life, while the metal staircase, balcony balustrades and shelving units take inspiration from typical shopfronts and intricate architectural elements and vernacular design found in Mexico City. The numbered matte verdegris copper bathroom doors, visible from the mezzanine and as you enter the restaurant, are bespoke designs by Michaelis Boyd that are inspired by retro American and South American motels. Plaza Pastor is a 100-cover heated outdoor dining terrace adjacent to Casa Pastor, with a centrally located blackened steel cladded bar and open kitchen with cut out backlit branding. The space, which has its own separate menu, is more casual, lively and drinks focussed. The restaurant features industrial cast iron beams, slatted oak banquette seating, Michaelis Boyd signature crittall glass screens and lush foliage and greenery. Michaelis Boyd have also designed a small mobile stage area for live music.